Fars Province , is one of the thirty-one provinces of Iran and known as the cultural capital of Iran . It is in the south of the country , in Iran's Region 2 , and its administrative center is Shiraz . It has an area of 122 ,400 km² . In 2011 , this province had a population of 4.59 million people , of which 67.6% were registered as urban dwellers , 32.1% villagers , and 0.3% nomad tribes . The etymology of the word "Persian" (From Latin Persia , from Ancient Greek Περσίς (Persis)) , found in many ancient names associated with Iran , is derived from the historical importance of this region . Fârs , or known in Old Persian as Pârsâ , is the original homeland of the ancient Persians . The native name of the Persian language is Pârsi . Persia and Persian both derive from the Hellenized form Περσίς Persis of the root word Pârs . The Old Persian word was Pârsâ . The ancient Persians were present in the region from about the 10th century BC , and became the rulers of the largest empire the world had yet seen under the Achaemenid dynasty which was established in the late 6th century BC , at its peak stretching from Thrace-Macedonia , Bulgaria-Paeonia and Eastern Europe proper in the west , to the Indus Valley in its far east . The ruins of Persepolis and Pasargadae , two of the four capitals of the Achaemenid Empire , are located in Fars . The Achaemenid Empire was defeated by Alexander the Great in 333 BC , incorporating most of their vast empire . Shortly after this the Seleucid Empire was established . However it never extended its power beyond the main trade routes in Fars , and by the reign of Antiochus I or possibly later Persis emerged as an independent state that minted its own coins . The Seleucid Empire was subsequently defeated by the Parthians in 238 BC . By 205 BC , Antiochus III had extended his authority into Persis and it ceased to be an independent state . Babak was the ruler of a small town called Kheir . Babak's efforts in gaining local power at the time escaped the attention of Artabanus IV , the Arsacid Emperor of the time . Babak and his eldest son Shapur I managed to expand their power over all of Persis . The subsequent events are unclear , due to the sketchy nature of the sources . It is however certain that following the death of Babak around 220 , Ardashir who at the time was the governor of Darabgird , got involved in a power struggle of his own with his elder brother Shapur . The sources tell us that in 222 , Shapur was killed when the roof of a building collapsed on him . At this point , Ardashir moved his capital further to the south of Persis and founded a capital at Ardashir-Khwarrah (formerly Gur , modern day Firouzabad) . After establishing his rule over Persis , Ardashir I rapidly extended the territory of his Sassanid Persian Empire , demanding fealty from the local princes of Fars , and gaining control over the neighboring provinces of Kerman , Isfahan , Susiana , and Mesene . Artabanus marched a second time against Ardashir I in 224 . Their armies clashed at Hormizdegan , where Artabanus IV was killed . Ardashir was crowned in 226 at Ctesiphon as the sole ruler of Persia , bringing the 400-year-old Parthian Empire to an end , and starting the virtually equally long rule of the Sassanian Empire , over an even larger territory , once again making Persia a leading power in the known world , only this time along with its arch-rival and successor to Persia's earlier opponents ; the Byzantine Empire . The Sassanids ruled for 425 years , until the Muslim armies conquered the empire . Afterwards , the Persians started to convert to Islam , this making it much easier for the new Muslim empire to continue the expansion of Islam . 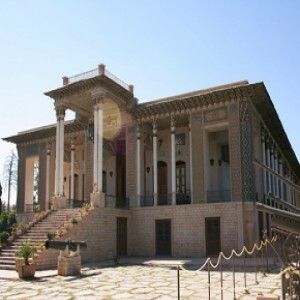 Persis then passed hand to hand through numerous dynasties , leaving behind numerous historical and ancient monuments ; each of which has its own values as a world heritage , reflecting the history of the province , Iran , and West Asia . The ruins of Bishapur , Persepolis , and Firouzabad are all reminders of this . Arab invaders brought about a decline of Zoroastrian rule and made Islam ascendant from the 7th century . Fars province is located in the south of Iran . It neighbours Bushehr Province to the west , Hormozg�?n Province to the south , Kerman and Yazd provinces to the east , Isfahan province to the north and Kohgiluyeh and Boyer-Ahmad Province to the northwest . According to the latest divisions , the province contains the following counties . There are three distinct climatic regions in the Fars Province . First , the mountainous area of the north and northwest with moderate cold winters and mild summers . Secondly , the central regions , with relatively rainy mild winters , and hot dry summers . The third region located in the south and southeast , has cold winters with hot summers . The average temperature of Shiraz is 16.8 °C , ranging between 4.7 °C and 29.2 °C . The geographical and climatic variation of the province causes varieties of plants ; consequently , variation of wildlife has been formed in the province . Additional to the native animals of the province , many kinds of birds migrate to the province every year . Many kinds of ducks , storks and swallows migrate to this province in an annual parade . The main native animals of the province are gazelle , deer , mountain wild goat , ram , ewe and many kinds of birds . Arjan Meadow 22 km2 (8.5 sq mi) and Lake Parishan 40 km2 (15 sq mi) are designated Wetlands of International Importance under the Ramsar convention . Agriculture is of great importance in Fars . The major products include cereal (wheat and barley) , citrus fruits , dates , sugar beets and cotton . Fars has major petrochemical facilities , along with an oil refinery , a factory for producing tires , a large electronics industry , and a sugar mill . Tourism is also a large industry in the province . UNESCO has designated an area in the province , called Arjan (known as Dasht e Arjan) as a biosphere reserve . Shiraz , provincial capital of Fars , is the namesake of Shirazi wine . A large number of wine factories existed in the city . The main ethnic group in the province constitutes of Persians (including Larestani people) , while Qashqai , Lurs , Kurds , Arabs , Georgians , and Circassians constitute minorities . Due to the geographical characteristics of Fars and its proximity to the Persian Gulf , Fars has long been a residing area for various peoples and rulers of Iran . However , the tribes of Fars including , Mamasani Lurs , Khamseh and Kohkiluyeh have kept their native and unique cultures and lifestyles which constitute part of the cultural heritage of Iran attracting many tourists . Among the hundreds of thousands of Georgians and Circassians that were transplanted to Persia under Shah Abbas I , his predecessors , and successors , a certain amount of them were to guard the main caravan routes ; many were settled around Āsp�?s and other villages along the old Isfahan-Shiraz road . By now the vast majority Caucasians that were settled in Fars have lost their cultural , linguistic , and religious identity , having mostly being assimilated into the population . The province has a population of 4.6 million approximately . Shiraz Airport is the main international airport of the province and the second in the country . The cities of Lar and Lamerd also have airports linking them with Shiraz and Tehran and nearby Persian Gulf countries such as the UAE and Bahrain . Shiraz is along the main route from Tehran to southern Iran . The Fars Province is home to many higher education institutes and universities . The main universities of the province include Shiraz University of Medical Sciences , Shiraz University , Shiraz University of Technology and Islamic Azad University of Shiraz .